You are here: Home / blog / Need a Cheap Laugh? The world can be a horrible, nasty, rotten place. You can get away from it all and have some giggles with this e-book on sale for only $.99. 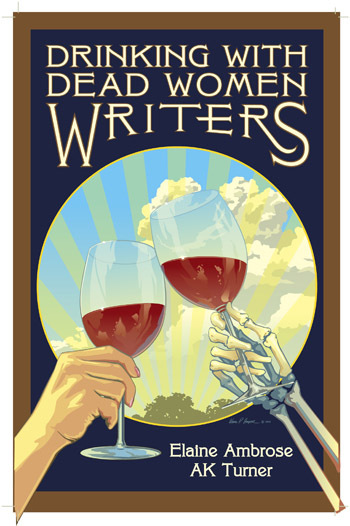 Drinking with Dead Women Writers E-Book by fearless authors Elaine Ambrose and AK Turner is on sale on Amazon.com for one week beginning October 2. The original price was $2.99, so act fast because the deal ends next Friday. The book received three awards from the Idaho Book Awards: Top Author, Fiction, and Cover Design. Follow this link to buy the e-book and share laughter and libations with literary ladies. The authors make you believe they shared drinks and stories with 16 authors, including Dorothy Parker, Erma Bombeck, Louisa May Alcott, and Emily Dickinson. Discover fascinating facts, such as Jane Austen’s original title for Sense and Sensibility was Elinor and Marianne. The book was reviewed as “a fantastical romp through literature and drink.” Buy it now. Laugh soon. Erma Bombeck would approve.